EVANSVILLE, Ind. — A federal judge appointed by Ronald Reagan has placed a permanent injunction on a plan by a number of Indiana churches to display a collection of artistic crosses in the middle of their city. As previously reported, West Side Christian Church (WSCC) in Evansville recently announced plans for the first annual “Cross the River” campaign, scheduled for August 4–18. By collaborating with several community churches, WSCC members were hoping the project would raise funds for the Evansville Rescue Missions Camp Reveal and Childcare Assistance Resources of Evansville. The Evansville city council conducted meetings over the matter, and agreed that the display would be constitutional, since it was presented by a number of churches and not the city itself. 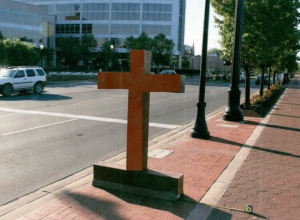 However, days after the board unanimously approved the display, the ACLU—a church-state separatist group—filed a lawsuit, arguing that the Cross the River project violates the First Amendment of the U.S. Constitution. On Wednesday, Judge Sarah Evans Barker agreed with the ACLU and issued a permanent injunction against the display. However, Barker said that it was the expanse of the project that was the issue, not the crosses in and of themselves. Attorney Keith Vonderahe, who has been representing the city, told the Indy Star that he has not yet decided whether to appeal the ruling.